Strengthening the capacity of National Malaria Control Programs to manage IRS programs is a key component of the PMI-funded Africa Indoor Residual Spraying (AIRS) project. In collaboration with Rwanda’s Ministry of Health’s Malaria and Other Parasitic Diseases Division (MOPDD) and with the support of the Government of Rwanda and PMI, AIRS conducted trainings throughout 2014 to strengthen the skills and knowledge of more than 150 key stakeholders on IRS planning and implementation, monitoring and evaluation, logistics, and procurement at both district hospitals and health centers in the districts of Bugesera, Gisagara, and Nyagatare, where IRS is implemented. “We are now at a stage where district hospitals should take the lead role in the implementation of IRS in collaboration with sector authorities and MOPDD hence the importance of these training sessions,” said Emmanuel Hakizimana, Director of Vector Control at MOPDD. The new entomology research lab. Spray operators learn how to pressurize the spray pumps. In addition to strong management capacity, progress in malaria control also requires a deep understanding and knowledge of the mosquitoes carrying the disease. AIRS conducts complex entomological surveillance and research to understand vector behavior, composition, and density. The project also tests mosquito resistance to, and the residual life of, insecticides throughout the malaria-transmission period. 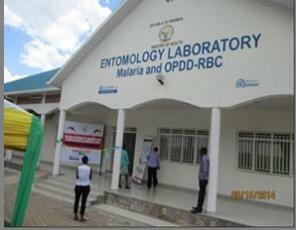 In partnership with MOPDD, AIRS established Rwanda’s first modern entomological laboratory in September to identify malaria-carrying mosquitoes and monitor the efficacy of vector control interventions. 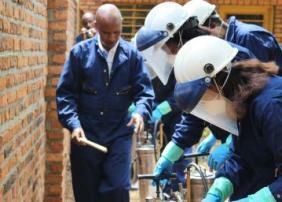 The new laboratory, located in Kigali, will focus on species identification of malaria vectors, knock-down resistance, insecticide susceptibility, and rearing of Anopheles gambiae s.s., a susceptible strain of the vector for use in bioassays, and training of internship students in advanced entomological techniques.